You've decided to sell your home. You've done your due diligence in preparing to put it on the market. You've meticulously staged it and strategically scheduled open houses. You've given the listing agent the green light to list it. And amazingly, your very first showing generates multiple offers. Sounds like a homeowner's dream problem, right? In today's real estate climate, bidding wars are something more and more home sellers are having to navigate. While this is a great problem to have, multiple offers could muddy the waters and confuse the process of accepting an offer and closing the deal. Making the wrong choice could cost you time, stress, and thousands of dollars in lost profits. It's important that you understand the homebuying process from a seller's perspective. Sure, you've been through the process, but it was as a buyer and not a seller. Changing your perspective and understanding the potential roadblocks at each stage is crucial. Before listing your home, you should know what your priorities are for selling. 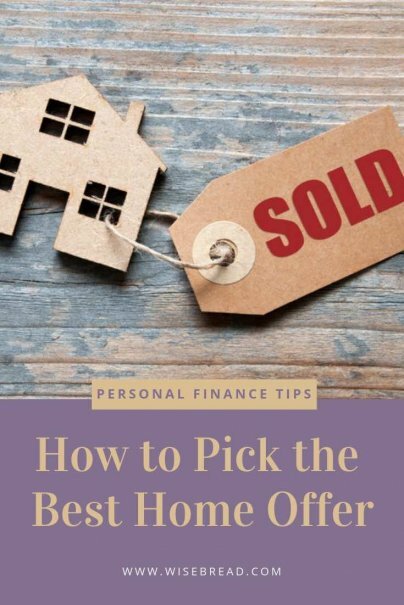 While getting the most money may seem like it should be the ultimate end goal, the highest offer may not be the best offer. For example, if you're looking to purchase another home once your current home is sold, the closing date becomes a much bigger priority. This is especially true if you've already found a home you want to make an offer on. Or, you may be trying to stave off foreclosing or avoid a short sale. In that case, the bottom line becomes extremely important. Another example may be that you were offered your dream job in another location and you've decided to sell instead of renting your current place. The closing process becomes extremely important. Certain types of financing and mortgages can dramatically lengthen the time it takes to close, and they can also add additional contingencies that don't accompany conventional loan financing. Creating a process for reviewing and assessing offers will save you so much time and energy. Once you've established your priorities and non-negotiables, it's easy to set parameters on the types of financing, time to close, and contingencies you're willing to consider. It's also smart to set a deadline for accepting offers. You can set a hard date cutoff when you reach a certain number of offers. Once you've gotten those things established, the process gets much easier and it'll help you not feel overwhelmed by it all. While you're in the process of categorizing, reviewing, and assessing offers, it's important to calculate your total net profit for each serious offer. For example, if a potential buyer is offering the full asking price but has no down payment, is asking for $3,000 in closing costs, and requests a closing date three months from the date of contract, you definitely want to pause and do the math. If you have another buyer who offers $1,500 less than the asking price, but doesn't request any closing costs and can close in 45 days, that deal is far more profitable than the first. Ensuring that you do the math and find the offer that is not only the most profitable, but the most beneficial to you is key. Finding a buyer who is flexible enough to close quickly but allows you to stay in the house and pay them rent for two months while you find another place is so much more valuable than an extra $2,000 profit. Make sure you take time to pause and view each offer from multiple perspectives.